Clay Travis and Cousin Sal bought a Saints Super Bowl future ticket from PropSwap for $57,500. If New Orleans wins, it’d pay $168,000 in total. It marks the biggest purchase price in PropSwap’s history. The original bettor wagered $8,000 on the Saints, so he/she made a hefty profit, even after PropSwap’s commission. A pair of sports betting TV personalities bought a futures ticket on Friday night on PropSwap for $57,500. Clay Travis and “Cousin Sal,” who both appear on FS1’s “Lock It In,” were the buyers. 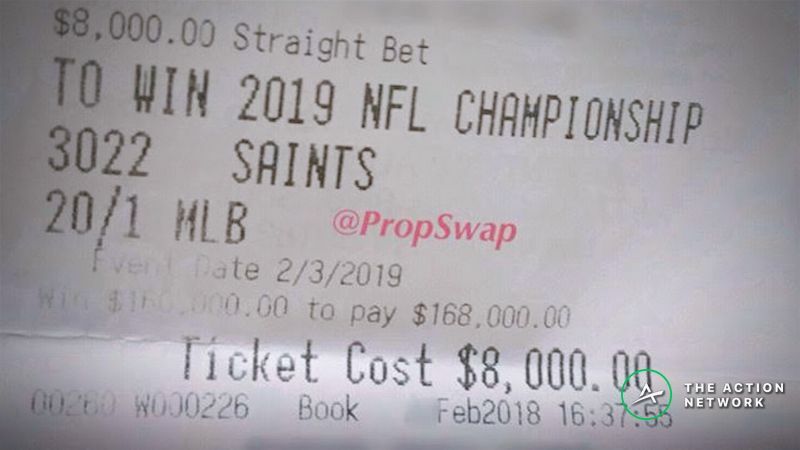 The ticket, placed at the South Point in Las Vegas last February, is for an $8,000 bet at 20-1, returning $168,000 total ($160K in profit) if the Saints win the Super Bowl. Travis told The Action Network that the futures bet was a major subject on the show this week. There was so much interest that Travis and “Cousin Sal” just decided to buy it, splitting the cost down the middle. Travis said he has had more potential money on the line for parlays, but this is his largest single bet he has ever made.